I love crunchy rice. Not uncooked rice, but that wonderful golden crust that forms at the bottom of a hot pan or pot when making rice. Korean people call it nooroongji (누룽지), and it’s delicious in any form, Korean or not. Nooroongji is key in dolsot bibimbab (돌솥 비빔밥, bibimbab in a stone pot), paella (nooroongji is referred to as soccarat in Spanish), and also in bo zai fan, Chinese clay pot rice. Recently, I had some really great bo zai fan with lots of crunchy browned rice at A-Wah, a tiny restaurant with only a handful of tables in Chinatown. At A-Wah, the meal began with a small bowl of soup on the house. If you aren’t Asian, the waitress may ask you first if you want soup. She did this to a white guy sitting at a table across from us. The reason being, I don’t think it’s something everyone will like. 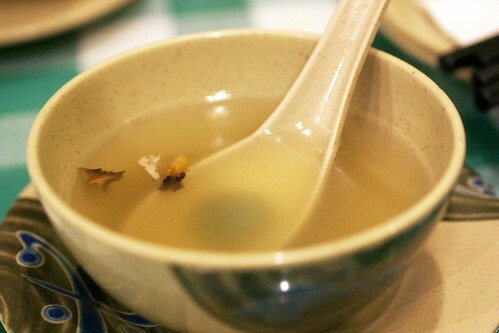 Flavored with ginger and ginseng, the thin soup tasted slightly bitter and medicinal. Personally, I liked it. I found it fragrant and soothing. David just found it medicinal. I’m not sure what the white guy thought. 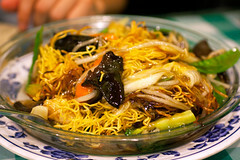 After the soup, David’s order of Buddha Supreme Pan Fried Noodles ($7.95) arrived at the table. 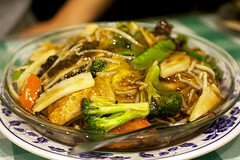 I usually like pan fried noodles with seafood, but this vegetarian version was quite tasty. Although more interesting vegetables would have been appreciated over the generic broccoli and carrots, the thin egg noodles were fried really well so they remained crunchy under the thick sauce, which by the way wasn’t overpoweringly soy sauce heavy as it is at most restaurants. I’ll be ordering this again the next time I go, with or without David. After I had a good share of David’s noodles, the waitress brought my bo zai fan, Minced Pork with Squid Rice Casserole ($6.25). The minced pork with squid was in patty form over the rice, and although it could have been more generous in comparison to the amount of rice in the clay pot, it was good. Steamed with the rice, there’s wasn’t any char on the meat, but it was soft and pliant like a pork version of hamburger steak with chewy squid chunks and crunchy diced water chestnuts. The best part, however, was the scrumptious browned rice at the bottom. Again, the patty was small in proportion to the rice, but I didn’t really mind it because of the delicious crunchy bits. Drizzled with bo zai fan sauce, a thick sweet sauce made from dark soy sauce, I was in crunchy carb heaven. For those not satisfied with less meat than rice, extra protein in the form of roast meats, sausage, or egg can be added to any of the clay pots for a few more dollars. I’ll be making another trip to A-Wah soon. Especially now with the colder weather creeping up on us, I’ll be going when I need a little warmth and a lot of crunch. The crunchy rice is the best part! Will definitely have to check out this restaurant, as I’m always looking for good places in Chinatown. You recommend a lot of great places, by the way, thank you! @Connie – Yes, definitely the best part. And thanks, hope you like it, but I can’t take all the credit. I read about A-Wah in the Village Voice. @Nicholas – You know I always thought that too, until A-Wah. I’ve had really bad clay pot rice before in Chinatown, but they know what they’re doing at A-Wah. Cool, clay pot rice in chinatown! I used to go to Yummy Noodle for claypot but, the quality slowly declined. I liked some of the clay pot rice dishes at Congee Village on Allen St, too. Now, there’s an alternative option. Thanks! @Pat – Yes, I used to go to Yummy also. A-Wah is better! 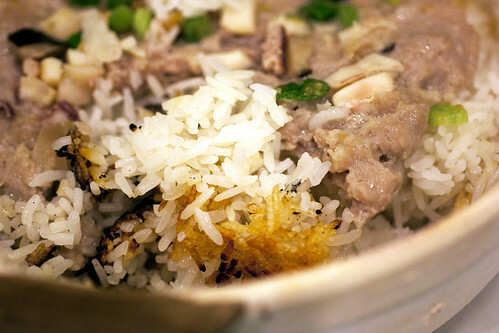 Hrm, I used to live right by Congee Village and I never had a clay pot rice dish there. Weird, I must remedy this. @Kenny – My readers are so interesting! 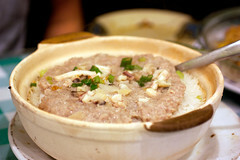 And we do the congee-type thing with the crunchy rice part too. Not red beans though, but I will try it out! Actually, congee village doesn’t serve a classic bo zai fan. They have the classic combos of chinese sausage, bone in chicken w mushrooms, & eel. But, the rice & meat mixture is served in a bamboo looking log without the burnt-crispy rice bits like a bo zai fan should be 🙁 tasty but not quite the same. @Pat – I’ve seen that log-like thing. Booo. We need hot crunchy bits. oooh that looks good. I have to agree with Nicolas, the bibimbap with crunchy rice bits taste better than the bo zai fan that I’ve had at yummy noodles in Chinatown. Namely, they falter where you said they do.. the rice to protein proportion is off. Too much rice! I have to give this a-wah a try though. aaah! crunchy bits are the best! i have soooo considered getting my own stone bowl to recreate bibimbap at home! @Danny – It’s so much better than Yummy Noodles. Trust me! @Sarah – I need a new set too. Now that my kitchen is slightly larger (and I stress slightly!) in my new apartment, I can get some decent cookware now. i’m 2nd generation chinese and my mother’s from hong kong. we went to a korean restaurant recently where they scraped the crunchy rice and served it in a bowl with hot water, which pleased my mom so much – she called it “nong” and said it’s traditionally served w/ preserved salted tofu. i remember this, vaguely, as a child. it was watery, crunchy, comforting and salty. A couple of years late but Persians call their crunchy rice “tadig” and it’s amazing! @Jasmine – Oooh, good to know & and better late than never!